Freedom Alliance teamed up with the Ward Burton Wildlife Foundation again this Spring for an event to support injured service members and veterans. Thirty men and women from the Army, Air Force, Coast Guards and Marines were invited to spend the day competing in a series of outdoor sporting activities including fishing, archery, and clay shooting. “Being part of this event with Ward Burton and being able to come out here with the warriors is a fantastic opportunity to say on behalf of the American people, thank you,” Freedom Alliance Executive Director, Calvin Coolidge, told a local newspaper covering the event. 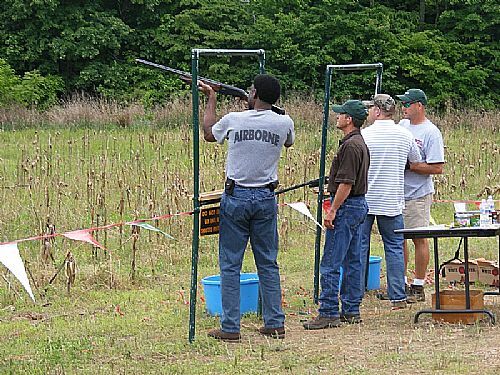 Professional sportsmen assisted in helping to sharpen the skills of each participant as they competed for trophies, prizes, and bragging rights. At the end of the day all participants and staff gathered for a barbeque dinner, outdoor live entertainment and an award ceremony. During the award ceremony Coolidge presented Burton with a signed letter of appreciation from LtCol Oliver North. In honor of Freedom Alliance’s sponsorship, Burton presented Freedom Alliance with a patriotic themed NASCAR driver’s helmet with a Freedom Alliance Logo in its design. Freedom Alliance’s Military Leadership Academy will return to Burtons Wildlife facility this summer to conduct a two day Field Training Exercise which will provide cadets a glimpse into what our nation’s heroes in harm’s way go through every day to protect themselves and our country.